Online grammatical appendix and grammatical index, including newly revised sections: "Vergil's Meter" and "Rhetorical Terms, Figures of Speech, and Metrical Devices"
Boyd's edition of selections from Books 1, 2, 4, and 6 of Vergil's Aeneid is designed for high school or undergraduate use, and the 923 lines covered by this book reflect the most recent requirements for the Advanced Placement Latin exam. While instructors and students preparing for the Advanced Placement exam will surely appreciate a commentary based on the Advanced Placement syllabus, other instructors will find Boyd's book useful as a textbook for advanced high school students or intermediate undergraduates. The Latin is divided into neatly labeled sections, so instructors and readers can easily skip around if need be. The book follows the design of Pharr's classic, user-friendly commentary,1 as have Boyd's earlier editions of Aeneid commentaries, 2 with vocabulary and notes on the same page as the text. This style of text and commentary has proven popular over the last century, and Boyd's contribution is certainly a boon to the newest generation of Latin students. The book includes an introduction to Vergil and the Aeneid, a helpful commentary, a selected bibliography, an appendix on dactylic hexameter, an appendix of rhetoric devices, and a vocabulary. The introduction to the text will be familiar to readers of Boyd's 2003 update to Pharr; it is largely unchanged. She provides background information on Vergil and the Aeneid, giving students a historical, political, and literary context for the work. She avoids overwhelming her audience with citations to scholarship, but is nonetheless careful to mention scholarly issues. For example, on Callimachus' influence on the Aeneid: "scholars have long puzzled over how Vergil was able to find some compromise between the apparent polar opposites of epic and Alexandrianism, and how that compromise is articulated in the Aeneid." She offers an explanation and invites readers to look for clues to form their own opinions. Boyd reaches both extremes of her target audience: the bolded key words and timeline of events will be especially appreciated by less experienced readers, and a brief bibliography (on the topics covered by the introduction) will be useful for students who wish to know more. The text itself follows Mynors' 1969 OCT, with the minor changes of capitalizing the first letter of sentences and changing third declension accusative plurals from -is to -es. As Boyd explains, these changes seem appropriate for an intermediate audience. Similarly, she has changed the consonantal 'u' to 'v', and uses consonantal 'i.' Boyd continues Pharr's methods of italicizing unglossed words in the text; this mixture of Roman and italic fonts may be helpful to some and distracting to others. Macrons appear in the text and in the vocabulary; students learning to scan will appreciate this, and teachers hoping to challenge their students to scan without aid may not. The vocabulary attending the text has been updated from Pharr's definitions. Some archaic definitions have been removed: modern students will be glad, for instance, that glaeba (1.531) is no longer defined as "soil, clod, glebe," as it was by Pharr, but the more comprehensible "a lump of earth, clod" provided by Boyd. Her definitions are both full and specific to context. The commentary features occasional plot synopses, boxed off from the main part of the commentary, to give a brief overview of the story and new characters. In her notes, Boyd is careful to provide historical and literary background for beginning and intermediate readers. For instance, at 1.92, she explains that Greeks and Romans prayed with their palms up, hence duplices palmas. At 1.12, she discusses the "curious" use of urbs antiqua fuit, noting that Carthage is ancient to us and to Vergil's contemporaries, but was not yet founded at the fall of Troy. She stops short, however, of commenting on why Vergil may have chosen to frame the story this way. Boyd notes in her preface that she intends to leave her commentary "open and suggestive," so perhaps this is an opportunity for classroom discussion. Other interesting opportunities for discussion include her notes on the theme of anger in the Aeneid and the Iliad (1.11), etymology of Dido's name (4.211), or the use of the future tense at 6.847ff. A teacher using this text will find many such occasions for thoughtful discussion, but independent readers could benefit from more thorough notes in these places. Boyd is extremely helpful in identifying rhetorical devices, and she frequently discusses the significance of the device. In Ilioneus' speech, for example, she identifies and explains the implications of several rhetorical devices: she notes that the hyperbaton "suggests the lofty aspiration of his speech" (1.522-3) and that he uses tricolon and alliteration to emphasize the most important parts of his speech. Less often, she simply notes the device and leaves the student to test her own knowledge by determining its significance (e.g. the combination of anaphora and tricolon crescens at 4.307-8 is noted but not discussed). Boyd is generally thorough in her explanations of syntax. Often she provides a reordering of the Latin, or she supplies syncopated syllables or elided words, so that even intermediate readers can read the Latin independently, without resorting to a translation. Boyd notes that she provides alternate interpretations of certain constructions so that students learn "their instincts are often right when they are puzzled by the ambiguity of a particular construction." This confusion allows a reader to understand the text as a Roman audience might have, without the artificiality of syntactic constructions, but with a choice of constructions and their attendant meanings. At times, however, she does not explain constructions as thoroughly as an intermediate reader might need: the infinitival direct objects at 1.66 and 1.522-3, for instance, have no citation to the grammatical appendix and no real explanation, although the objective infinitive is listed in Pharr's appendix (260). Elsewhere, there are references to the Greek middle (1.561, 2.210, 2.219, 2.221, 2.227, etc.) that would likely flummox an intermediate reader; the citation in the grammatical appendix (309) is not entirely helpful. These issues are few and far between. Throughout the commentary, explanations of syntax refer students to Pharr's grammatical appendix (at least at the beginning; the references disappear once the function of syntax has appeared many times and the reader has, presumably, learned the construction). Pharr's grammatical appendix, however, does not appear in this text. Whenever a reader needs to consult the grammatical appendix, she must consult the 85-page file on the Bolchazy-Carducci website. Pharr's appendix is unchanged, although it has received a bit of a facelift, matching the style of Boyd's book and making it a bit easier to read. Removing the appendix from the text allows for a smaller, more easily handled, and presumably cheaper book, but it may make for a cumbersome reading experience. While some readers may prefer to consult the appendix on a mobile device in one hand while reading the printed text in the other, many others (myself included) will miss the printed version at the back of the book. This, to my taste, is the biggest flaw of the book.3 At the end of the book, Boyd has included an up-to-date and almost entirely Anglophone bibliography on the Aeneid; a brief appendix on meter (revised from Pharr's); a helpful list of rhetorical devices, their definitions, and examples of them in the Aeneid; and a glossary. The vocabulary includes all the italicized words from the text, without the confusing organization of Pharr's "word lists" designed for vocabulary drills. She does, fortunately, include Pharr's handy pull-out vocabulary sheet. With her latest edition of selections from the Aeneid, Boyd has provided her intermediate reading audience with another accessible, extremely useful text and commentary. I recommend it in particular as an excellent resource for Advanced Placement teachers and students, with the caveat of the separate grammatical appendix. Intermediate undergraduates may be able to read the entire book in one course, and the reward of such an accomplishment makes the book an attractive option for an undergraduate audience as well. For readers seeking a broader selection of the Aeneid in a more affordable option, Boyd's 2003 edition shares many of the benefits of the book under review. ________________________________________ Notes: 1. Pharr, Clyde. 1930. Vergil's Aeneid: Books I-VI. Boston, MA: D.C. Heath and Company. 2. Boyd, Barbara Weiden. 2003. Vergil's Aeneid: Selections from Books 1, 2, 4, 6, 10, and 12. Wauconda, IL: Bolchazy-Carducci. Boyd, Barbara Weiden. 2006. Vergil's Aeneid 8 and 11: Italy and Rome. Wauconda, IL: Bolchazy-Carducci. (See BMCR 2007.01.24.) 3. The book is very well edited. I found just one typo: an incomplete bolding in the definition of adeo on page 5. Vergil was is influential literary figure from Roman antiquity down to the present day. Generations of students have studied his works as a means of gaining fluency in the Latin language. 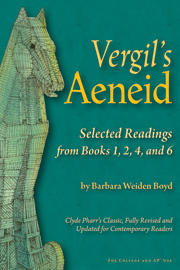 In "Vergil's Aeneid: Selected Readings from Books 1, 2, 4, and 6", academician Barbara Weiden Boyd draws upon her many years of experience and expertise as the Henry Winkley Professor of Latin and Greek at Bowdoin College to produce an annotated 298-page compendium specifically designed to be a curriculum text for high school and college 'Advanced Placement' courses. Beginning with an informed and informative introduction on the life and work of Vergil, "Vergil's Aeneid: Selected Readings from Books 1, 2, 4, and 6" includes same-page vocabulary notes, a General Word List, a selected bibliography, and more. Highly recommended for academic library "Latin Language Studies" reference collections, "Vergil's Aeneid: Selected Readings from Books 1, 2, 4, and 6" is ideal for a self-study Latin Studies personal reading list.